Fabulous quality, very soft and warm, colors go perfectly in my newly painted room. Very cheerful! 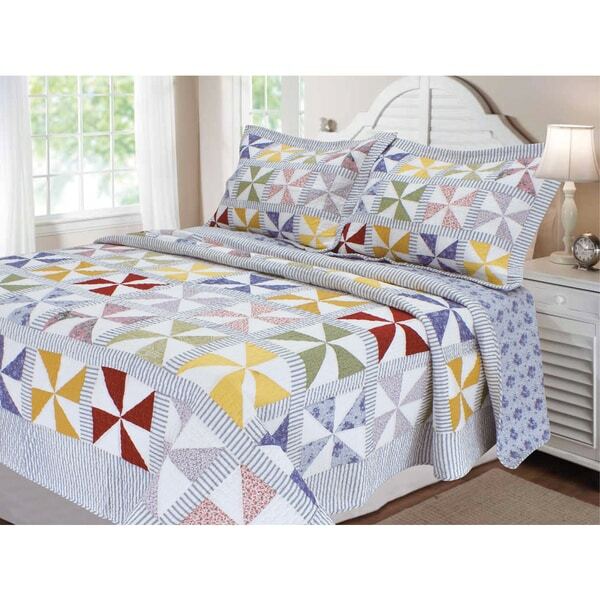 Add a fun flair to your bedroom with this patchwork carnival pinwheel quilt. Featuring traditional quilted pinwheels, the bright blues, reds, golds, and greens provide a splash of eye catching, charming color to any decor. Love the bright colors on this quilt. The only thing I'm terribly disappointed in is the fact that the pillow shams are truly impossible to PURCHASE ANYWHERE!!! Overstock should be a lot more VERBAL in the advertisement by letting their customers know that the quilts DON'T COME with the comforter. The pic shows the shams. I read the description and assumed (my bad) the shams came with the quilt because there were no shams advertised as being for sale separately. But then if people knew for SURE the shams were sold separately and not advertised additionally, they wouldn't sell. I did find another store that advertised them (shams) being sold separately, but as luck has it they're on backorder! It is a great quality made quilt and I've wanted it for over a year so I'm keeping the king size that I bought. I also bought the twin size so that I can make it into two king size shams. Plus, Overstock makes you pay return postage on EVERYTHING!! Even on the most defective merchandise you get sent. I'm not going to get ripped off again by returning merhandise to Overstock. Love this quilt. Super pretty oversized and very cozy. I have 4 stars as I thought shams came with quilt and they do not. I can't fine gem anywhere either. Totally charming! Well made with beautiful color choices. I was pleasantly surprised at how nice this quilt looks! The colors are just like the photo, and the fabric looks like a vintage handmade quilt. I am very pleased with my purchase! I was looking for a quilt that was colorful, versatile, and that both my husband and I would like. Turns out, we both love it! It adds the color that was lacking in that room plus a cottage/farmhouse feel that we wanted. It's perfect! Perfect weight, nice colors and has washed up nicely with no fading. Just wish it was a little bigger due to the mattresses being so deep now. I really like the quality and look of this cotton quilt. It's just what I wanted, for an excellent price. Perfect summer quilt -- with or without shame! Lovely, cottage-look. Lightweight but by no means cheap. It is clear from product info that shams are not included; for the bellyachers, you should not have relied only on the photo. Just buy solid-color or ticking shams, and move on! Amazing Quaility! Looks handmade and beautiful! Looks even better in person. Colors are wonderful and it has the old time quilted look. Great purchase! Great quilt, made well, appropriate weight, good quality cotton. I thought the backing was striped material but it is an unusual flower pattern. I love this quilt so much I both two! It is every bit as beautiful in person!!! Great quality and a great price! This quilt is beautiful and goes perfect in the room. Painted the wall yellow. I just love walking into this room. "Does this quilt have purple in it? I can't tell if it is purple or blue (or both). Thank you." "Is this a pieced quilt?" NO!! This quilt has been available for over 5 years, and has been sold by EVERY department and online store. I didn't buy it until 2015-16. When I received it from Overstock I assumed the SHAMS were just going to be in the bag. Nope just the quilt. I was so mad because everywhere this quilt had been advertised the pics show it with shams. I searched nation wide for weeks just to find out this manufacturer only sold the twin size shams for this comforter! I finally found a company that was selling the single shams but for the last year they were on backorder. I came across harshly to Overstock for this and I still feel awful over that. I thought that only NAUTICA BRAND sold shams separately and I always thought that a cheap shot. Buyer beware and always read the full description! "Are the shams included with quilt? If not where can we order them?" NO! Never has this manufacturer included SHAMS with this quilt. From my search the shams have only been available for a very short time in size TWIN SINGLE. I guess the fabric wholesaler biz must have burnt to the ground with every piece of this material in it's warehouse! Most likely not. I bought this from another store and no luck locating the sham for a twin. **** etc are all sold out of them. Same with me. A real deadend search. The twin size sham was the only size made. The company that I did find it available at has had it on backorder for a couple of years now. I bought the twin on sale and will make two king sized shams out of that so I have a set. Good luck.